The University of Chicago's Rockefeller Chapel. Image via FIRE. UPDATE: An Elephant In The Woods can exclusively report that ALL returning UChicago students will be given a letter similar to the one the Class of 2020 received. Read more about it here. Student protesters around the country have shut down countless events over the years, and the University of Chicago was sadly no exception to this trend. At least 308 speakers have been cancelled before speaking or shut down in the middle of their speeches since 2000 for an incredibly wide variety of reasons. The University of Chicago is known as a beacon of academic freedom that schools such as Princeton, Purdue, and others have looked to when crafting their own statements on the importance of free speech. The University of Chicago’s Rockefeller Chapel. Image via FIRE. This upcoming academic year will be the 50th anniversary of the Kalven Report, which was written during the Vietnam War to affirm the importance of a university that does not silence voices. More recently, University of Chicago Law School Professor Geoffrey Stone released his Stone Report which has become the gold standard for speech codes around the country, with at least 11 campuses adopting similar codes. In 2016 alone, 21 speakers were prevented from sharing their thoughts on campuses, and two of those happened at the University of Chicago, one of which I attended. The first occurred when Chicago State’s Attorney Anita Alvarez was invited by campus’s Institute of Politics (which is run by none other than David Axelrod, no one’s idea of a conservative) to speak in a series that featured the candidates for Chicago’s State’s Attorney. Alvarez had the final date to speak at an event that was “free and open to the public.” However, seven minutes into her speech, several protesters took over the event for about ten minutes and Alvarez left the premises, preventing anyone from hearing what she had to say (or to ask her questions about her record, which has left much to be desired). A small group of protesters, some of whom were openly supportive of another candidate, shouted her down. The great irony is that, through their actions, they ensured no one would get the chance to ask Ms. Alvarez challenging questions. One of the ugly turns in the public discourse these days is coarseness and intolerance—the notion that we should not simply disagree with the people with whom we have differences, but we should deny them the right to speak. The IOP was created, in part, to be a safe place where people of differing views, parties, and backgrounds could air their ideas and make their cases, and grapple with provocative questions. This commitment to free and open debate is not only consistent with a university setting, but also with a healthy, functioning democracy. At another point in the year, Palestinian Human Rights activist Bassem Eid was shut down and his life threatened by members of Students for Justice in Palestine. (Our chapter of SJP openly supports and raises money for a convicted murderer of college students; for more on that, read here.). The campus Dean on Call responded by shutting down the entire event, rather than evicting the protesters who shouted that they would blow up Eid’s car. Eid’s crime was that he was not sufficiently anti-Israel for these protesters, one of whom shouted that he would follow Eid to future events planned in Chicago. On Israel’s Independence Day, members of SJP shut down students trying to speak about their ties to Israel by shouting into a megaphone, and the same Dean on Call who had shut down the Eid event threatened to close down the tent for Yom Ha’Atzmaut instead of telling the protesters that they were not allowed to shut students down. These antics from SJP are to be expected. It was recently revealed that on a national level, SJP “collects data on where Jewish students live on US campuses,” so this is far from surprising behavior. In fact, recent congressional testimony revealed the terrorist network that funds many of the activities of SJP groups around the country. A few weeks later, I introduced a resolution to the General Assembly of the University of Chicago, which is composed of the student governments of The College and the Graduate Divisions. There were a few other lowlights of this presentation, which included a graduate representative saying that he believes that it is the role of students to shut down events that are too controversial. At a different point, I had to explain to one of the undergraduate representatives why it is a bad thing that two of the 21 events that had been shut down were on our campus. In the aftermath of this meeting, I met with administration officials to discuss further steps to take to ensure that the student body of the University of Chicago understands the values of the university that it attends. In addition to these events on the University of Chicago’s campus, earlier this year, DePaul University in Chicago descended into chaos when its chapter of College Republicans invited Milo Yiannopoulos to speak on campus, and Donald Trump’s rally at the University of Illinois in Chicago was shut down before it even started. I was at both the Milo and Trump events, and both were absolutely insane. I have problems with both Milo and Trump, but I was also legitimately interested in hearing what they had to say, which was denied to me when both of their events were cancelled entirely. The events chronicled in detail are only the ones that I have first or second-hand knowledge of (Jason Riley has an excellent first person account of what it is like to be disinvited as a campus speaker here)! Our commitment to academic freedom means that we do not support so-called “trigger warnings,” we do not cancel invited speakers because the topics might prove controversial, and we do not condone the creation of intellectual “safe spaces” where individuals can retreat from ideas and perspectives at odds with their own. The full letter from Dean Jay Ellison can be read here. 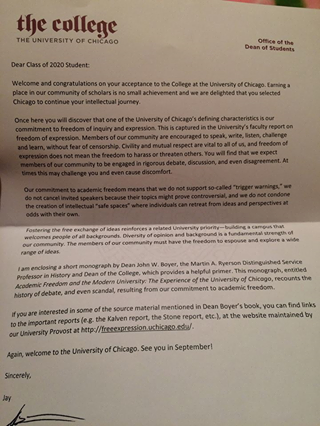 In addition to this letter, students also received a book by the Dean of the College, John Boyer, entitled Academic Freedom and the Modern University (which can be read online here). The book details the importance the University has placed on free speech since its founding, chronicling the contributions of University presidents such as William Rainey Harper, Robert Maynard Hutchins, and more. 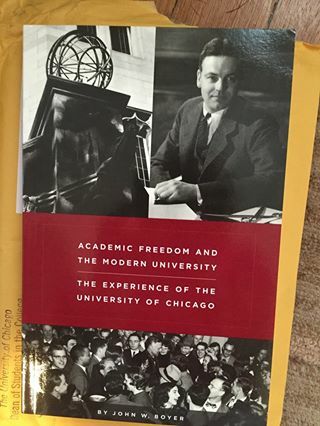 Dean John Boyer’s book about the importance that the University of Chicago has historically placed on free speech. Bravo to the University of Chicago for standing up for its stated values of the power of inquiry, intellectual destination as well as its long and storied history of standing up for the rights of speakers to be heard on campus! Hopefully this will inspire the newest generation of University of Chicago students to take these values to heart, and hopefully other schools around the nation will once again be inspired by the Chicago Model of free speech and expression. As far as I can tell, this is the first article written about this letter that will hopefully be the first of many more sent to students down the road. So please, share this with your administrators!